I can import Sony FDR-AX33 XAVC S video into FCP X/7/6. Why I can’t play the Sony FDR-AX33 4K XAVC S video in FCP X/7/6 smoothly? The rendering time is too long. Sony FDR-AX33 Handycam camcorder featuring a 1/2.3″ Exmor R CMOS sensor, the AX33 delivers Ultra HD-resolution (3840 x 2160) video at 24, 25, or 30 frames per second and Full HD 1080p up to 60 fps using Sony’s efficient XAVC S codec (100 Mbps for 4K and 50mbps for 1080p). The point here, many users are facing issues[and]find it a painful experience to import Sony FDR-AX33 XAVC S footage into Final Cut Pro (which includes the FCP X, FCP 7, FCP6 or the former). How to solve the crashing problem[and]avoid rendering? Here, I am looking at how to bring Sony FDR-AX33 recordings into FCP X/7/6 on Mac. Fortunately, there is an easy way to fix the issue. Since Final Cut Pro is designed to work best in ProRes codec, the easy workaround is to use 3rd-party software to convert Sony FDR-AX33 XAVC S Videos to ProRes MOV for FCP X, FCP 7[and]FCP 6. UFUWare HD Video Converter for Mac, an excellent Sony FDR-AX33 video converter that can convert Sony FDR-AX33 XAVC S videos to ProRes MOV on Mac. What’s more, this powerful 4k video to ProRes Converter, which can convert Nikon, Sony, Panasonic, JVC footage to ProRes 422, ProRes 4444, ProRes 422 Proxy, ProRes 422 HQ, ProRes 422 LT for Final Cut Pro X/7/6 easily. How to convert Sony FDR-AX33 XAVC S on Mac? Tip: If you want to import and edit Sony FDR-AX33 1080P XAVC S video in FCP X/7/6, you can use the same way to convert XAVC S Videos to ProRes 422/ProRes 4444 MOV for Final Cut Pro on Mac. If you are Windows user, and don’t know how to get Apple ProRes video on Windows 10, you can try UFUWare Windows Apple ProRes Converter. Start up UFUWare HD video Converter for Mac (Best XAVC Converter). Click “Add File” button to load 4K XAVC S clips captured by Sony FDR-AX33. 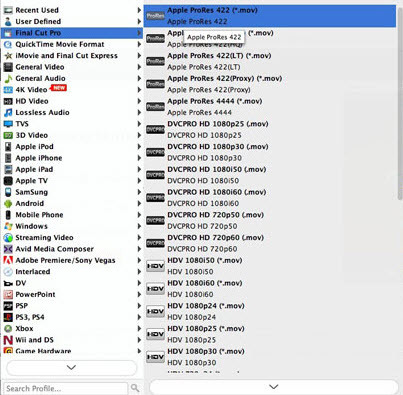 Choose “Apple ProRes 422 (*.mov)” as output format from “Final Cut Pro” profile list. Click “Convert” button to start Sony 4K XAVC S to ProRes codec video conversion on Mac. When the conversion is done, click “Open” button to get the generated ProRes 422 .movg files for editing in Final Cut Pro (FCP X, FCP 7, FCP 6). Follow File > Import > Files… to browse and load the transcoded Sony FDR-AX33 footage to Final Cut Pro X/7/6 for extending editing.